Bat encounters: Trapped or injured! 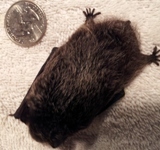 A bat found flying in the house, usually in late summer, is most likely a juvenile bat who simply got lost. You can help him exit by closing the door to the room he is in and opening all the windows (don’t forget to remove the window screens). The bat will become active at dusk and find his way out. If the bat has landed, you may also capture him using a towel or heavy gloves – or place a small cardboard box or coffee can over the bat and slip a piece of cardboard beneath him. If you are sure the bat can fly, release the bat outside at dusk. When releasing the bat, place the bat in a high place like a tree trunk, as it is difficult for a bat to take off from the ground. Watch to make sure the bat is capable of flight. A bat found in the house during the winter months (here in the northeast) has been aroused from hibernation. He should not be released outside, but given to a wildlife rehabilitator to assess his condition and possibly hold him over the winter for a spring release. A bat found on the ground or caught by a cat or dog should be brought to a wildlife rehabilitator as soon as possible. Scoop up the bat using heavy gloves or a towel and place him in a closed box. Provide a cloth for the bat to hide in. Bats and rabies: You cannot contract rabies from bat guano; nor can you contract rabies simply frombeing in the same room with a bat (aerosolized transmission). If you find a bat in your home and you are certain that there has been no physical contact (a bite or a scratch) you do not need post-exposure rabies vaccine. If the bat is found in a room with a person who cannot reliably rule out direct contact (eg, a sleeping person, a child, a mentally disabled person) the bat should be tested for rabies. * When releasing a bat I have personally draped a towel or soft screen over a tree branch (the material must be able to be grabbed by the bats feet, nothing too smooth), then with a glove on, held the bat in my hand next to the draping material. The bat crawls to the material and hangs there till dusk, and then takes off when ready.